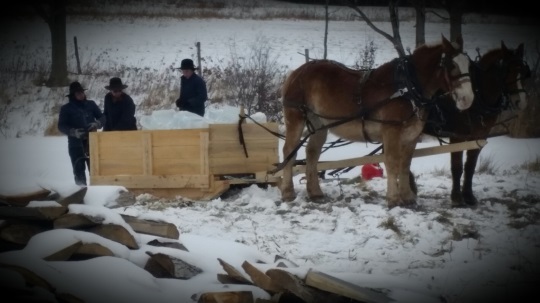 Following the recent post on ice cutting in Amish Iowa, reader Neil Shattuck shares a look at an ice harvest in New York. These photos were shot January 18 in the Jasper/Troupsburg, NY community. They are of a single family group of 3 brothers, and other family members filling the ice houses for the coming year. They cut enough ice for the three families that afternoon. The sled they used was of freshly cut timber sawn at the family sawmill. At noon the ladies of the family brought out coffee and cookies to fuel the boys up to finish up in the afternoon. 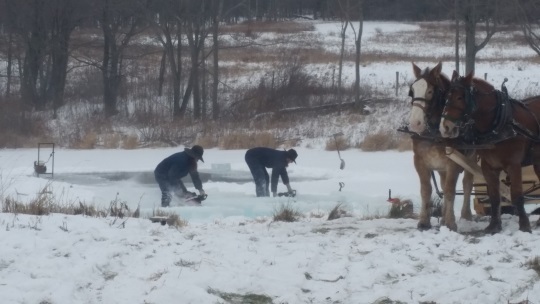 When cutting the ice, the process involved cutting long lengths of 18″ wide ice from a spring fed farm pond with a gaw powered circular saw on a cart. 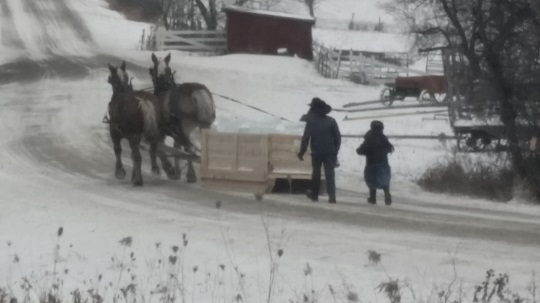 These were grabbed with ice tongs and pulled up onto the ice where they would proceed to cut the lengths into square blocks with a chain saw and stacked onto the wagon and off to the ice houses it goes. The boys worked very efficiently together with every step taken to quicken the job. When the ice is stacked in the icehouse they would pack snow in between the blocks to fill voids. They told me this ice would normally last them to about mid-October 2018. 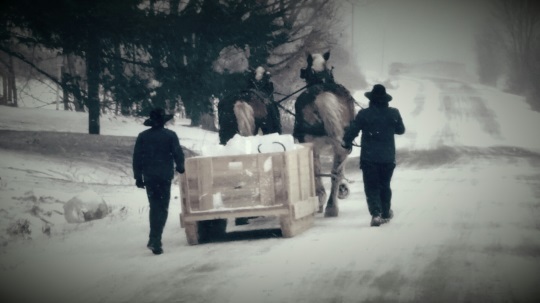 Ice harvesting is just one winter task done by (some) Amish. 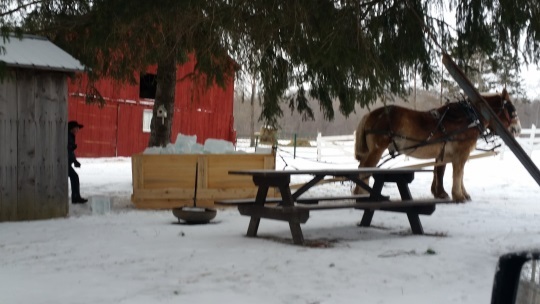 If you’ve ever wondered about how Amish handle cold weather, do other winter chores, cold-weather recreation, staying warm in schools and buggies, and other topics, we’ll have a post upcoming answering those questions, with input from an Amish-raised woman. So stay tuned! Ice cut by the Amish family farms here in the Patten area is used to cool the milk as it is produced. Only. Not for food refrigeration. All other days, the milk is cooled in the parlor with a water flood from the well, and then transported off site to be stored in a dairy owned conventional cooler. Sundays, the milk stays in the parlor and the ice cools it until Monday when it too is taken to the regular cooler. No refrigeration in these Amish homes as far as I know. Thanks Steve, sounds like ice-cutting country. We in Northern Vermont in 1850 and later had a creamery powered by water, a sawmill, shoe factory, box factory, cedar oil still, blacksmith shop, horse hospital made of stone and several ice houses along the mill pond. The water came from a mile long pond with a stone dam. We were all mostly happy, oblivious of the outside world. A very nice era in America. Eric, thanks for this very pleasant, enlightening post – and the responses above are (as is so very often the case at this site) also interesting. The brothers are, it seems to me, likely harvesting more than just ice. I suspect that their cooperative efforts for the benefit of the extended families probably make their mother and father feel like the brothers are also reaping the love of family sown by those parents while raising the boys. Nice point Randy – I think cooperative physical work has a way of bringing people together in important ways. At least that’s been my experience…I’m not from a manual labor background but when I’ve had those work opportunities, I tend to enjoy them (with *almost* no exception:)), and not just for the exercise. Thanks for sharing this. That is fascinating to see and learn about. What is the house house built from? What type of insulation might it have to keep the ice for up to 8 months? The ice houses are built from sip panels. Structural Insulation Panels. They are a sandwich of plywood OSB 12″Styrofoam and another layer of ply osb. After they construct the box itself they finish as any other out building. Wood siding. Vinyl etc. An insulated exterior door is used just like in a house. Except it wouldn’t have windows. WOULD IT BE PRUDENT FOR ICE HARVESTTERS TO WEAR AT THE VERY LEAST AN INFATABLE LIFE PRESERVER OVER THEIR COLD WEATHER COAT WHEN OUT ON ICE ? IT IS NOT CONVENIENT – BUT NEITHER IS DROWNING.